For the past year I’ve looked on from afar as a group of community members planted the seeds for a food cooperative: a member-owned grocery store open to all, seven days a week. At the time, I didn’t know much about cooperatives. Yet I was intrigued by the group’s vision to open a community grocery store (within the next two to three years) committed to showcasing the best local products in support of a strong local economy. In the meetings I attended, I observed a group of community members who were wrestling with practical considerations, methodically creating a sustainable plan, and making impressive progress. They seemed to strike the perfect balance between planning and actually acting. What’s more, they were bringing the community together through food. What really sold me was the “Share the Harvest” fundraising dinner back in October at Greenmoore Gardens. Seated at farm tables, we ate locally inspired lasagna and apple crisp and heard how Friends & Farmers was forging ahead. On Monday we launched our website, and began promoting a survey that’s crucial to this formative stage of our co-op. The survey is part of a feasibility study currently underway through the Keystone Development Center, which is offering its services free of charge thanks to a grant supporting cooperatives that benefit rural communities. We’re also organizing a potluck to update the community on our substantial progress. Unlike many start-ups, Friends & Farmers will pay dividends for the community. Cooperatives keep more money in the community, and exist to benefit their members. This is a business model that’s here to stay. According to an article in Yes magazine titled “How Cooperatives are Driving the New Economy,” more than 130 million people are members of a co-op or credit union and more Americans hold memberships in a co-op than hold shares in the stock market. Food co-ops are a fast-growing sector of this new economy. Not surprising considering the growing realization that our current food system is inflicting damage inside and outside of our bodies. Coincidentally, we’ve launched this initiative as Penn State formed the Sustainability Institute. In a video on Penn State’s website, a Penn State VP refers to sustainability as the “great social cause” of college students’ generation. Sustainability is also uniting generations. Whether you’re 21 or 81, the focus is on those who will come after us. Of course, a more sustainable food system has more immediate rewards, too. In our case, those rewards come in the form of a high-quality, member-owned grocery store that carries everything you’ll find at a traditional grocery store, but gives preference to locally grown and produced food. As for the details, the community—our voting members—will lead the way. So join the adventure. This isn’t just about sustainability or nutrition. It’s about the satisfaction gained in working together toward a common goal. It’s also a celebration of one of Central Pennsylvania’s biggest selling points: access to good food. Just look at the beautiful picture on our homepage. You won’t find greens that beautiful or delicious in the grocery store. They came from Tait Farm, plucked from a greenhouse just a few days before we took the picture. Wouldn’t it be great to have access to greens like that seven days a week? 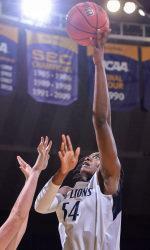 The Penn State Lady Lions saw their season come to an abrupt end last night, falling to the Tigers of LSU by a final score of 71-66. Penn State players could not solve the box-in-one defense LSU threw at them.